Halo Hud slightly changes the usual first-person view. On-screen indicators and model of your character showing skin will be updated, and the coordinates will be displayed at the center. With this small texture-pack you can turn the game into a kind of Halo. Open a space map and activate this pack. Yes, the game may like only to fans of the Halo universe. All surrounding world will look like if you put a scout helmet. There are four different colors of the interface of your choice, as well as for the other players if you play together. How to install the Halo Hud? Download the archive and select one of the colors. Then start the game and activate the downloaded pack (game settings). 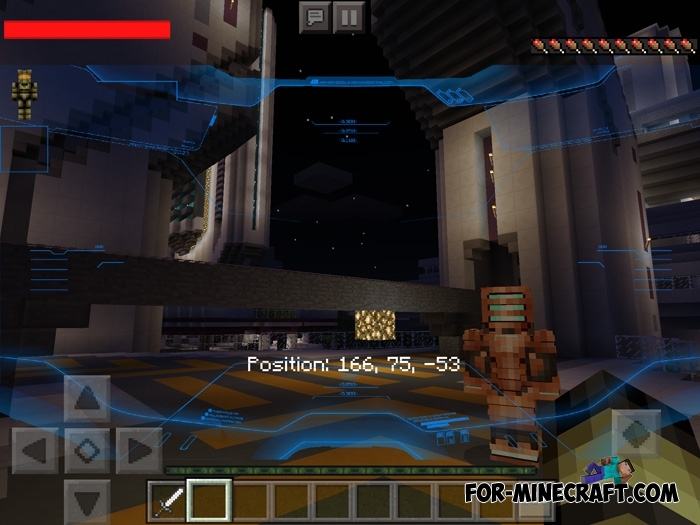 All players must install the texture pack to play with friends. Fans Mod for Minecraft PE 0.17.0/1.0.2Fans Mod adds six different fans with the help of which you can build unique structures or mechanisms..
Block Indicators mod for Minecraft PE 0.16.0Block Indicators Mod is a very simple mod but it really is essential for architects and builders in the world of Minecraft PE..